Computer monitor recycling is becoming very important as we are now updating our computer equipment much more frequently than ever before, and this is creating unprecedented levels of electronic waste (also known as e-waste). 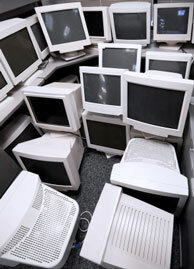 If computer monitors are not disposed of properly, the hazardous waste that they contain can seep into the ground. This damages the soil of the area making it unfit for future use, as well as getting into the ground water and contaminating nearby water reserves. lot of people. Some people rarely stop to consider whether their unwanted computer equipment might be of use to someone else, or if the parts can be re-used for some other purpose. This wasteful and inefficient attitude has to change so that we can reduce the amount of waste in landfills around the world, and reduce the need to extract new raw materials from the earth. Technological progress has meant that we are now updating our home and business technology products often, and more and more computer monitors and electronic waste is ending up in landfills and damaging the environment. Paying greater attention to computer monitor recycling may also have economic benefits as less money will need to be spent on raw materials. If you have a computer monitor that you would like to recycle, there are a few things that you can do. Firstly, if it is still in good working order (or even if it only needs minimal repairs) then you may want to consider donating it to a local charity. In this way you can be sure that the product is going to good use, and you may be making life easier for someone who is less fortunate then you. If the computer monitor is broken or unusable, then you have other computer monitor recycling options available. You could check to see if there are any local businesses or people who might be interested in using the monitor for spare parts. Depending on the make and model of the monitor you may even receive some financial compensation for this. Also bear in mind that some computer manufacturers will offer a discount on future purchases if unwanted computer equipment is returned to them. Another option is to contact your local government to see if they have any agencies, or work with any environmental groups, who correctly dispose of hazardous material. Some cities will often organize particular days where hazardous material and other hard rubbish can be collected from homes. This method of computer monitor recycling is a convenient and easy way of you to get rid of your unwanted monitors in a safe and environmentally sound way. Besides computer monitor recycling, have you thought about what to do with the rest of the equipment?